Depth of Winteris Craig Johnson’s fourteenth novel featuring lawman Walt Longmire, and to be honest, it is a disappointment. I say this with regret because I am a fan of the Longmire series, having read all thirteen previous novels as well as the two novellas and collection of short stories. My basic rule for fiction is whether it keeps me turning pages. On that account, the novel failed. I had to force myself to keep reading. This surprised me. The setup of the novel is good. At the end of The Western Star, Longmire’s archnemesis Tomas Bidarte had kidnapped Cady, fled to Mexico, and dared Longmire to come and get her (and him). This sets up Depth of Winteras a suspense novel focused on rescue and revenge. First, the novel is set in the badlands of Mexico, doesn’t include the usual cast of characters (e.g., Henry, Vic), and introduces other characters that won’t appear in any future Longmire capers. Plus, some of those characters—the legless, blind hunchback; the doctor/intelligence officer/anti-cartel vigilante; the mute Indian sniper—are caricatures, too overdrawn even for Longmire’s admittedly eccentric social network. Second, what makes fiction work is the reader’s willing suspension of disbelief. The overdrawn characters made me pay more attention to how unrealistic the setup is. Longmire is going to the heart of Mexican cartel country in order to rescue his daughter and kill his enemy. Alone? At his age? Longmire graduated from USC and served in Vietnam. He was in country during the Tet Offensive, which took place in 1968. At minimum, that means he’s 22 in 1968, which means he was born in 1946. (One estimate I saw online estimates his birthyear as 1943.) If the events of Depth of Winterare contemporary, that means Longmire is in his early to mid-70s. And he takes the hardships and beatings in this story as well as he does? I don’t thinks so. Third, Johnson’s previous novels in this series have been mysteries. There’s a crime, and Longmire solves it. Suspense novels work somewhat differently. There’s a complex problem that needs to be solved, but the question is whether the protagonist will solve it in time. Obviously, readers know that Longmire will at minimum get his daughter back and live, so the question is how tight his escapes will be, how just-in-time he’ll solve the problem. Unfortunately, given the problems I mentioned in my first two points, the tightness and just-in-timeness factors weren’t believable. As I said at the outset, I’ve been a fan of Craig Johnson’s Walt Longmire series, so I regret to file such a poor review of it. I’ll give Johnson one more novel in this series to recapture my interest, but at this point, absent a great follow-up novel to this one, I think it’s time for the sheriff to retire. Craig Johnson, Depth of Winter(New York: Viking, 2018). The Western Star is the thirteenth novel in Craig Johnson’s series of mystery novels featuring Walt Longmire, sheriff of Wyoming’s (fictional) Absaroka County. It’s also one of the best. How good? I read it in one sitting—four hours glued to my chair wondering what would happen next. The novel includes three narrative arcs. The first finds Walt in Cheyenne to argue against the parole of a killer he arrested in 1972. The second takes place in 1972, when Walt is a newly minted deputy of Lucian Connally and accompanies him on a junket of Wyoming sheriffs aboard The Western Star, a steam locomotive from which the book draws its title. When two of the sheriffs go missing, one presumed to have murdered the other, Walt gets dragged into solving the case. The third narrative arc concerns Tomas Bidarte, a criminal first introduced in A Serpent’s Tooth, who wants to kill Walt, but only after making his family suffer first. These three arcs come together in the book’s explosive conclusion, which, I have to admit, I didn’t see coming. And while they come together, they don’t completely resolve. In other words, The Western Star made me hope that Craig Johnson finishes his fourteenth Walt Longmire novel really soon. I want to know what happens next. Craig Johnson, The Western Star (New York: Viking, 2017). As a general rule, the book is better than the movie or television show that is based on it. 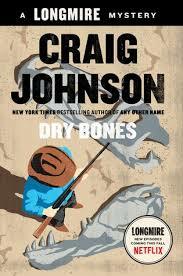 Even though A&E’s Longmire is good, Craig Johnson’s Walt Longmire mysteries are better. So, if you like the show, read the series! Spirit of Steamboat is the latest book in that series. It is less a whodunit than a who-is-he? In other words, Sheriff Longmire doesn’t solve a crime during the story. Instead, the story reveals the true character of one of his companions. A young Japanese woman walks into the sheriff’s office with a dry cleaning bag and a story to tell. It quickly becomes clear that she’s looking for Longmire and his crusty old predecessor in the sheriff’s office, Lucian Connally. At first, however, neither of them remembers her. But then, the memories come back: of a horrific car accident, a ferocious winter storm, and a dangerous life-flight to Denver. To be honest, it took me a while to get into this story. For me, it started slowly, and I kept putting it down. But when I finally set aside some time to read it, I read it through in a single sitting. 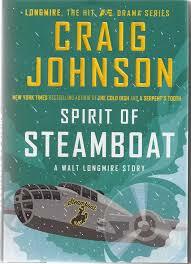 Craig Johnson is an excellent storyteller, and this one sucked me in at last. Bottom line: Not as good as Johnson’s Walt Longmire mysteries, but still pretty good. P.S. If you found my review helpful, please vote yes on my Amazon.com review page.